What is the value of a college rank? A little over a hundred bucks. The yearly ritual of the US News & World Report College rankings is always closely followed by the yearly ritual of lament over the ratings process itself. There has been some particularly good brooding on the topic this year, with the New York Times releasing a whole separate ranking based on economic diversity, Payscale releasing a ranking by salary, Boston Magazine looking at how Northeastern gamed the system, and Vox posting a summary broadside against the rankings and their value. The value of a ranking is tricky. It, at once, both reflects and shapes conventional wisdom about the college pecking order, making it difficult to measure, like a kind of educational Heisenberg uncertainty principle. And yet, if we are looking at value, there is a market where that value is set. Two markets, actually. One market on the way into college reveals what prospective students are willing to pay for these schools; and one market on the way out reveals what employers are willing to pay for their graduates. If we look at these two markets for the top 100 universities, we see two different situations. The average net price paid by students between colleges reveals that students do not actually pay more for higher ranked schools – separating out the categories of private and public universities. There is a host of reasons why this may be the case. Many schools offer financial aid and there is diminishing price sensitivity. Additionally, because many students are taking out loans for school, the cost is something that they think about as tomorrow’s problem anyway. Perhaps most significantly, the institutions themselves are not seeking to “sell more education.” As non-profits, these top schools are not really in the business of responding to market demand. To sum it up, the selling of higher education is an imperfect market. In the other market, potential employers and those hiring the graduates of these schools have no such genteel reservations, and they do pay for the perceived quality of their new employees (and a premium for technology schools). 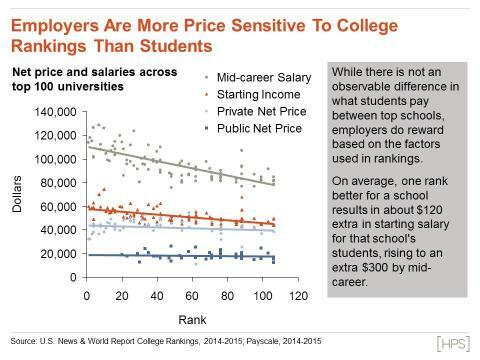 It is difficult to say that companies are paying for ranking as opposed to what the rankings measure, but if we conduct a linear regression of what employers actually pay, we find that on average among the top 100 schools, one notch in the rankings is worth about $120 extra in starting salary for that school’s graduates. Of course that $120 you get year-after-year and, by mid-career, the premium we see rises to $300 for each notch in the rankings. So what’s the value of a college rank? A little over a hundred bucks to start with. And incidentally, if you’re looking for a job, HPS is recruiting, but we don’t pay based on the rank of your school.